Organic Valley is a family farmer-owned cooperative that has been producing healthy, delicious organic foods since 1988. Supporting organic farmers regionally gives our customers the delicious, high-quality, fresh product they enjoy. Regional, organic production builds the local economy and allows rural communities to protect the environment in which their children are raised. 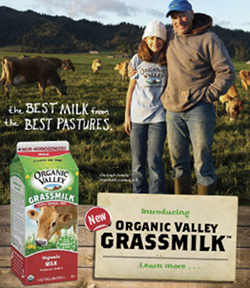 Their new specialty product to do just that is called Grassmilk. On the lush green pastures of Humboldt County, farms have taken sustainability and health to the next level. Cows there are %100 grass fed instead of the standard grains which means the milk they produce has naturally occuring Omega-3 , 6, CLA, and calcium. It's also non-homogenized so it's minimally processed. Now you can enjoy delicious organic milk, fruit and other Organic Valley foods while supporting farmers, boosting local economies, and protecting land and resources near you. Who's your farmer? Visit www.organicvalley.coop/who-is-your-farmer and find out!